Were you there in Chicago for the great ALA Midwinter blizzard of 2015? The Sunday of Midwinter was an event that few of us will forget. The snow blew sideways and it was recorded as one of the city’s top ten most intense snow storms! Through it all however, the relentless librarians forged on. We walked through swales of snow four feet deep. The cabs and shuttle buses even kept running. So, we hearty folk went on with our meetings, discussions, and awards events. Our RUSA membership demonstrated their dedication and the overall experience was awesome. Before the storm, those of us on RUSA Board began ALA Midwinter 2015 with a full-day strategic planning session on Friday. This was the first time (in recent memory) that we had allocated this much time to focus on the future direction of the association. Our session was facilitated by Paul Meyer of Tecker International Consulting. It is possible that this language could change as RUSA’s Strategic Plan Coordinating Task Force and the Board continues its work, but this should give you a good sense of the priority values that were identified at this early stage. The final hours of the day were dedicated to starting the process of developing Goals and Objectives that will move RUSA toward its envisioned future. Flexibility, Member Engagement, Leadership Development, and Training came forward as priorities as we began to develop the Goals. Some rough Objective statements were also developed. By the end of the day the broad feeling in the room was one of great accomplishment, and the effort that had been put forth showed on almost every face in the room. It was indeed a tiring but productive day! As of this writing in early March, the Strategic Plan Coordinating Task Force has met three times by telephone conference since returning from Midwinter to continue the work. Chaired by Anne Houston, the task force has reviewed what we accomplished in Chicago and is incorporating member priorities that were identified in the RUSA Review Task Force survey of summer 2014. The next step is to clean-up and revise the draft Goals and Objectives that came out of the planning meeting. Two goal areas that we have identified are the need for RUSA to have a flexible structure and the need for membership in RUSA to have clear measurable values. We anticipate having a revised draft plan for review by the RUSA Board before the end of March. I very much want to thank Anne for her leadership through this process, as well as RUSA Secretary Erin Rushton, who is serving above and beyond by taking comprehensive notes at each of our strategic planning meetings. The demand on her time is much more than could be expected during a normal year for a RUSA Secretary, and we appreciate all of the efforts she is putting forward. Our process is still on track to have a new RUSA Strategic Plan in place before ALA Annual 2015 in San Francisco. something new. We were very happy to have highly acclaimed Chicago author Margaret Hawkins kick-off the event by sharing some of her thoughts about the craft of writing, including insight into why she has set some of her scenes in libraries. The event then went on without a hitch. For a comprehensive list of the selections, including the Notable Books, Reading List, Listen List, and the Best Free Reference Web Sites, see http://www.ala.org/rusa/awards/literarytastes. Also, catch up on what attendees and others have been saying by following the hashtag #literarytastes. I do have one more item to share about RUSA Awards. Though January 2016 might seem far in the future, I want to give you the early news that we will have even more to celebrate while we’re in Boston for ALA Midwinter next year. Not only will we announce all of our Book and Media Awards, but we will be announcing the winners of the 2016 Andrew Carnegie Medals for Fiction and Nonfiction while in Boston as well! Be on the lookout later this year for news about what may evolve into a combined event at Midwinter 2016 and how it is shaping up. We have a rare crossover in place right now, as the members of both the 2015 and 2016 Andrew Carnegie Medal Award committees are currently at work reading and preparing to make their selections! The 2015 Andrea Carnegie Medals winners will be announced during ALA Annual 2015 in San Francisco. Among other noteworthy events at Midwinter in Chicago included the first ever RUSA Speed Mentoring Session, organized by our Leadership Development Task Force. Many thanks go to Gary White for serving as the event’s lead organizer, and to Diane Zabel for opening the session with words of experience regarding the importance of mentoring. About fifteen mentees attended, with more than that number of mentors available to pair-up. Immediately following this session we walked down the hall to the RUSA Membership Social, which received an excellent turnout of both new and familiar faces. The Social again served as a great informal opportunity to talk to others about our work in RUSA. I want to especially thank Ann Brown of the RUSA Membership Committee for serving as emcee for the event. 2015 RUSA President’s Program Planning Committee and the RUSA Just Ask Task Force joined forces in Chicago to host a discussion about some of the themes in danah boyd’s book, It’s Complicated: The Social Lives of Networked Teens (available for free download at http://www.danah.org/itscomplicated). One of our key discussions involved the collapsing of contexts, specifically relating to the modern reality that an online post made by an individual in one place might take on a very different meaning when interpreted in another. It was a dynamic discussion and we truly could have used more time than the hour that had been allocated! I want to thank Peter Bromberg for organizing the discussion and Cathay Keough for taking notes and posting these on our Facebook event page. You can find these at https://www.facebook.com/events/562596213874497/permalink/580179555449496. Are you planning your schedule for ALA Annual 2015 in San Francisco? The RUSA President’s Program with danah boyd, “It’s Complicated: Navigating the dynamic landscapes of digital literacy, collapsing contexts, and big data” will take place on Saturday, June 27, 2015 from 4:00 to 5:30. If you haven’t read danah’s work before, you can learn more by taking a look at her blog, where she focuses on the intersection between technology and society at http://www.zephoria.org/thoughts. danah is a principal researcher at Microsoft Research and is a 2008 PhD graduate of the School of Information (iSchool) at the University of California-Berkeley. Great learning opportunities abound – at conferences and online! Remember that RUSA’s opportunities for learning are available year-round online. Our upcoming online courses include the ever-popular Business Reference 101, Genealogy 101, and Health Information 101. Xtreme Bibliographic Searching for Interlibrary Loan & Reference as well as Introduction to Spatial Literacy and Online Mapping with both be offered this spring. Make sure to find these courses and our upcoming and archived webinars at http://www.ala.org/rusa/development/onlinece. If you are new to RUSA please also be aware that Ann Brown and I are continuing to offer free RUSA 101 webinars (orientations to all things RUSA) normally on the second Thursday of each month at 4:00 pm ET / 3 pm CT. We are also offering a free RUSA 201 webinar on the third Thursday of each month at 4:00 pm ET / 3 pm CT. The topic of each RUSA 201 is geared to current members and addresses how to get the work of the association accomplished. For the January and February sessions we had Don Boozer, chair of RUSA Conference Program Coordinating Committee, address how to propose a RUSA conference program, preconference, or institute for Boston or Orlando in 2016. Topics for upcoming RUSA 201 sessions will be announced on the rusa-l listserv. Are you looking to get involved in RUSA this year? Now is the time! RUSA’s Vice President/President Elect Liane Taylor and the RUSA Section Vice Chairs are appointing people to committees now, with terms to officially begin on July 1, 2015. If you are interested in joining a committee, go to http://www.ala.org/rusa and select the link in the upper right, “Volunteer for a RUSA or section level committee.” If you’re not sure which committee is right for you, send Liane an email at ltaylor@txstate.edu to let her know your interests. If it’s actually a BRASS, CODES, History, MARS, RSS, or STARS section-level committee you’re interested, she can put you in touch with the right person there. I want to take this opportunity to again thank all of our fantastic RUSA member volunteers across the association, with special thanks to everyone working in the BRASS, CODES, History, MARS, RSS, and STARS committees who are putting together great programming, developing discussions, reviewing materials, selecting awards, and working on other initiatives that provide our members a valuable RUSA experience. We each have many competing priorities in our lives and you cannot be thanked enough for your time and dedication to our work. I confess. I behaved unprofessionally when I found out I would be representing RUSA in the 2015 class of ALA Emerging Leaders. Excited young librarians had begun tweeting about their acceptances the day before, so I began preparing myself for the inevitable “thanks but no thanks” notification. When I opened an acceptance email instead, there were several minutes of untoward shouting, cheering, and jumping up and down. The shock has worn off, but I’m still delighted to introduce myself as a 2015 Emerging Leader. My name is Beth Boatright, and I’m a Business and Emerging Technologies librarian at Indiana University-Purdue University Fort Wayne. I’ve been active in RUSA for several years, serving on committees in MARS and BRASS and eventually accepting some committee-level leadership roles. RUSA has been an important part of my growth as a professional, and I am honored to be representing our organization as an Emerging Leader this year. The Emerging Leaders program is an ALA initiative that helps fifty librarians develop their leadership potential, collaboration skills, and volunteerism. After a one-day training session at Midwinter, groups of emerging leaders tackle service projects for the Association. This year, teams will be working on projects for AASL, APALA, ALCTS, ALSC, GODORT, HRDR, LearnRT, NMRT, PLA, and RUSA. (If you don’t know what those acronyms are, it’s okay. ALA is a confusing place.) I’m proud to be serving on the RUSA project team. We are learning about libraries that provide publishing services, with the goal of discovering how RUSA might provide meaningful support for this area of librarianship. The Emerging Leaders program has changed over the last several years, but most alumni agree that it’s up to each participant to make the most of the experience. I am working hard to develop my leadership and project management skills while I collaborate on RUSA’s project. I’m also hoping to find and foster relationships with librarians across ALA; our profession is full of amazing mentors, and I have a lot to learn. I’m grateful to RUSA for sponsoring my participation in this program. I’m eager to share with you the ways that Midwinter exceeded my expectations and other updates from my Emerging Leaders experience. Watch RUSA News for new posts in the coming months! Join us at 2015 ALA Annual Conference in San Francisco for some exciting events. Below are some highlights to look forward to. Come April, you will be able to use the ALA Conference Scheduler to create a personal schedule and you will be alerted to any last minute location changes. The two books selected as recipients of the Medal will be announced during the Awards ceremony on Saturday, June 27. The ceremony will be from 8:00-10:00 PM. Location will be announced in April. Tickets are available here. Cosponsored by Booklist and RUSA. Have you seen the new e-newsletter, direct from the RUSA office? Emailed straight to your inbox every Friday morning and it’s free to all RUSA members. You can view all the issues here and at the RUSA website under the Communications tab. Andrew Carnegie Medals for Excellence in Fiction and Nonfiction Ceremony and Reception. Ticketed event; separate registration required; registration information here. Friday, June 26, 8:30 AM-4:30 PM. The Core: A Year (Or More!) In, How Does This Affect Librarians? Acquisitions, Collection Development, Electronic Resources, and Interlibrary Loan (ILL), Oh My! Connecting Users to What They Want! As always, you can count on RUSA to offer signature courses like Genealogy and Reference Interview, but RUSA has added new upcoming online courses and webinars, that will interest learners at any level. Reference Interview – April 6 – May 17. This is a comprehensive course focusing on the methods of evaluating reference service, behavioral aspects of reference service, and the different types of questions that can be used to help patrons identify what they need. Read more and register. Xtreme Bibliographic Searching for Interlibrary Loan & Reference – April 20 – May 17. (Live Sessions on Thursdays, Time 1 p.m. CST) Mansel Pre 56 to Digital Repositories, DOAJ to Trove to HathiTrust. Don’t know those terms…then this course is for you! Read more and register. NEW COURSE! Learner-Centered Reference and Instruction: Science, Psychology, and Inclusive Pedagogy – April 6 – May 17. This course will introduce library practitioners to empirically sound approaches to learner-centered teaching that can be applied to creating effective reference and instruction services that maximally facilitate student learning. Read more and register. Students will learn to use the Instructional Design Process and apply it effectively to library instruction which includes: identifying instructional problems, learner analysis, task analysis, defining instructional objectives, sequencing content, identifying instructional strategies, message design, instructional delivery, and evaluation instruments. Read more and register. ● Universal Design for Learning, Information literacy, and Libraries – April 1, 1:00 – 2:15 PM. Gain information about Universal Design for Learning… Read more and register. ● What is Content Marketing + Should You Be Using It at Your Library? – April 3, 2015, 2:00 – 3:15 PM. Understand content marketing. Read more and register. ● Reference Interviewing: Best Practices in Action April 06, 1:00 – 2:00 PM.How to improve interaction with the online. Read more and register. ● Spice it Up with Pura Belpre! Using Award Winning Titles and Other Resources to Celebrate the Hispanic Influence in Literature for Youth April 30, 10:00 -11:00 AM. Read more and register. ● Exploring Partnerships with Faculty and Other User Groups for Digital Humanities Projects May 12, 2:00 – 3:30 PM. Learn to identify partnership opportunities within your institutions. Read more and register. Isadore Gilbert Mudge Award, RUSA’s highest honor, sponsored by Gale Cengage Learning, offers $5,000 and a citation to an individual who has made a distinguished contribution to reference librarianship. Denise Beaubien Bennett, Engineering Librarian, University of Florida, was selected for her instrumental shaping of the instructional program for thousands of students in many disciplines, with a reputation for inspired teaching and creation of many online and video tutorials, and presentation of workshops nationwide. Gale Cengage Learning Award for Excellence in Reference and Adult Services, sponsored by Gale Cengage Learning, offers $3,000 and a citation to a library or library system for developing an imaginative and unique resource to meet patrons’ reference needs. Lauren Comito was selected for the development of the interactive database, “Where in Queens?” which uses GPS technology to help users connect to social services that are closest to where they are located at any given time. NoveList’s Margaret E. Monroe Library Adult Services Award, sponsored by NoveList, which offers $1,250 and a citation to a librarian who has made significant contributions to library adult services. Neil Hollands, Adult Services Librarian, Williamsburg Regional Library, was selected for being a leader in the Readers’ Advisory (RA) world. Holland’s development and advocacy of form-based RA has been a tremendous advancement in RA services. Reference Service Press Award, sponsored by Reference Service Press, consists of $2,500 and a plaque which recognizes an author(s) of the most outstanding article published in Reference and User Services Quarterly (RUSQ), RUSA’s research journal, during the preceding two-volume year. Pauline Dewan, Laurier/Nipissing Liaison Librarian for the Brantford, Ontario campuses of Wilfrid Laurier University and Nipissing University was selected for her article, “Reading Matters in the Academic Library: Taking the Lead from Public Librarians.” Summer 2013, Volume 52, Issue 4. This article explores the idea of revitalizing academic libraries by reconsidering the place of pleasure reading in them. John Sessions Memorial Award, consists of a plaque sponsored by the Department for Professional Employees, AFL-CIO, and recognizes a library or library system which has made a significant effort to work with the labor community and by doing so has brought recognition to the history and contribution of the labor movement to the development of the United States. The Calcasieu Parish Library System was selected for its Southwest Louisiana (SWLA) Workforce Resource Guide. The guide offers essential step-by-step instructions for job seekers and providing contact information and guidance for where to go, who to call and what to say. The Academic Business Librarianship Travel Award, which consists of citation and $1,250, is awarded to an individual new to the field of academic business librarianship in order to support attendance to the ALA Annual Conference. Grace Liu, Business Reference Librarian at University of Maine, was selected as this year’s recipient. The Emerald Research Grant Award, sponsored by Emerald Group Publishing, consists of one $5,000 grant awarded to an individual or team seeking funding support to conduct research in business librarianship. Jason Dewland, Assistant Librarian and Cindy Elliott, Engineering & Innovation Librarian, University of Arizona were selected for their study, “Review of Research Methods Employed by Start-Ups,” which will identify networks of new businesses that can be targeted for data collection and to identify the research practices and information needs of new start-up businesses. The Gale Cengage Learning Excellence in Business Librarianship Award, sponsored by Gale Cengage Learning, offers $3,000 to a librarian providing outstanding business reference services. Peter Z. McKay, Business Librarian, University of Florida is this year’s winner for his innovative development of online business collection development, instructional resources, service to BRASS and his invaluable contributions to the profession. The Gale Cengage Learning Student Travel Award, sponsored by Gale Cengage Learning, offers $1,250 in travel funds to the ALA Annual Conference and a one year BRASS membership to a student in an accredited MLIS program. Sara F. Hess, MLIS candidate, University of Michigan School of Information was named as this year’s recipient. The Morningstar Public Librarian Support Award, sponsored by Morningstar, offers $1,250 to a public librarian providing business reference services so they may attend the ALA Annual Conference. Barbara Alvarez, business liaison librarian, Barrington Area Library (Illinois) was selected for her extensive range of activities in support of the local business community, including one-on-one appointments to assist business professionals and entrepreneurs, podcasts, as well as maintaining a business blog and a SlideShare account with business database tutorials. Zora Neale Hurston Award, sponsored by HarperCollins, offers $1,250 in travel funds to the ALA Annual Conference, tickets to the United for Libraries’ Gala Author tea, and a set of the Zora Neale Hurston books published by Harper Perennial. Carolyn Garnes, Founder and CEO of Aunt Lil’s Reading Room. 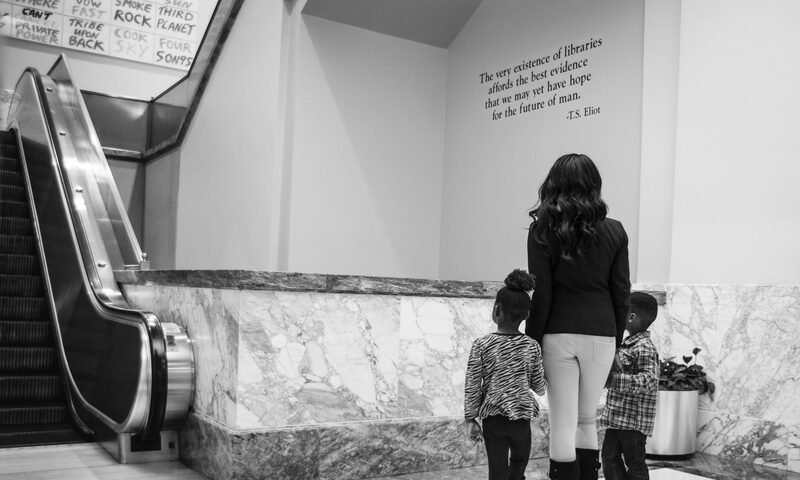 Aunt Lil’s Reading Room serves as a platform for children, authors, and illustrators of color and African descent. The project aims to promote the unique history and culture of African Americans through books, literature and storytelling. Louis Shores Award, offers a citation which recognizes an individual reviewer, group, editor, review medium, or organization for excellence in book reviewing and other media for libraries. Brad Hooper, Editor of Booklist was selected for his passion and commitment to book reviewing. Hooper reviews a wide variety of genres for Booklist, hosts workshops and has published books that give librarians reviewing and readers’ advisory skills they need for success. The Gale Cengage Learning History Research and Innovation Award, sponsored by Gale Cengage Learning, offers $2,500 and a citation to a librarian in need of funds to facilitate and/or further research in history or historical librarianship. David J. Gary, Kaplanoff Librarian for American History, Yale University Library was selected as this year’s winner for his project “Toward a Sociology of Knowledge: The History of Acknowledgment Pages in American History Monographs,” which will “take thousands of acknowledgement pages from e-books and hand-selected acknowledges since 2000 and use the methodology of the digital humanities to analyze them en masse,” said Gary. The ABC-CLIO Online History Award, a bi-annual award of $2,500 sponsored by ABC-CLIO, recognizes the accomplishments of a person or a group of people producing (1) a freely available online historical collection, or (2) an online tool tailored for the purpose of finding historical materials, or (3) an online teaching aid stimulating creative historical scholarship. Joanne Murray, Historian and Director, The Legacy Center, Drexel University College of Medicine, was selected for her work as Principal Investigator of the online history project called “Doctor or Doctress? : Explore American history through the eyes of women physicians.” The first runner up was Jason Roe for “The Civil War on the Western Frontier”; the second runner up was Robin Katz for TeachArchives.org. The Genealogical Publishing Company Award, sponsored by Genealogical Publishing Company, offers $1,500 and a citation to a librarian or library in recognition of their professional achievement in historical or genealogical reference, service or research. Michael D. Kirley, retired librarian from Los Angeles Public Library History & Genealogy Department after 39 years of service (1970-2009). Kirley single-handedly built the Genealogy Collection at the Los Angeles Public Library, which consists of more than 50,000 volumes of individual family histories in addition to more than 2,500 circulating books about genealogical research, heraldry and related subjects. These include print, microform and digital resources. The Genealogy Collection wouldn’t be what it is today without his painstaking efforts. The My Favorite Martian Award, which offers a citation to a member of the MARS: Emerging Technologies in Reference Section that has contributed exceptional service to the section. Debbie Bezanson, Associate University Librarian for Research and User Services, George Washington University Libraries, was selected for her tireless advocacy for the section and her service as a role model for collaborative teamwork and leadership. The RSS Service Achievement Award consists of a citation which recognizes a member that has made exceptional contributions to the Reference Services Section. Liane Taylor, Head of Acquisitions, Texas State University, was selected for continuously playing a vital role in RSS, both in leadership, and as Chair, but also by representing RSS to RUSA and beyond throughout the library profession. The Atlas Systems Mentoring Award, sponsored by Atlas Systems, Inc., offers $1,250 to a library practitioner new to the field of ILL and resource sharing to fund travel expenses to ALA Annual Conference in San Francisco. Karen Thomas, Access Services Librarian at Krauskopf Library, Delaware Valley College was named as this year’s recipient. The Virginia Boucher-OCLC Distinguished ILL Librarian Award, sponsored by OCLC, offers $2,000 and a citation to a librarian showing outstanding professional achievement, leadership, and contributions to interlibrary loan and document delivery. Lars Leon, Resource Sharing Librarian and Head of Organizational Development, University of Kansas Libraries, was named as this year’s winner for his impressive breadth and depth of knowledge about interlibrary loan, his enthusiasm about mentoring new practitioners and advocating with upper-level library administrators to recognize the importance of resource sharing in their organizations. Sponsor a table at the ceremony! Table reservations will open in late February. Stay Tuned! Each table can accommodate up to 10 individuals and ensures that attendees will enjoy this exciting evening with their friends, colleagues and fellow book lovers. Table reservations will open late February and will remain open until mid-May. The table reservation form can be found here. If you wish to order one or more individual tickets, you may do so via Annual Conference registration site at www.alaannual.org. Individual ticket holders will find open seating at non-reserved tables. If you order 10 individual tickets from conference registration, you will be ordering 10 individual open-seating tickets. Individual ticket holders who reserved their ticket before conference will pick up their banquet ticket on their first day of conference at registration. Individual ticket sales close at 12 Noon (CST) on Friday, June 26. The Just Ask Task Force has continued to meet have been discussing its future goals. The Task Force is developing social media tools that reference staff can use to highlight what they do, including a #JustAsk social media campaign. Reference staff would be encouraged to Tweet some of their most interesting questions using the #JustAsk hashtag. We are hoping to compile these as a way to highlight the variety of questions we receive. Said another way, it’s a way to tell our story. Stay tuned for more details. Just Ask co-sponsored the Midwinter RUSA Discussion Forum as a lead-in to the upcoming President’s Program. Although the attendance was only about 20 the discussion was lively. Creating a the prototype of “librarians are” posters working with the RUSA Office marketing staff, and work with “Librarian Wardrobe” blog to get photographs for the posters. Plan a free webinar for late spring related to President’s program and our committee goals of marketing reference librarians and use of social media in reference or privacy and censorship—how do we adjust reference to meet the real needs of new types of searchers? Writing an “Emerging Leaders” proposal to get an emerging leader group to work on the marketing campaign. Further define how to market what a “reference librarian” is; please feel free to share your ideas with us. Just Ask will meet online early in March. The RUSA Conference Program Coordinating Committee (CPCC) held two meetings since the last RUSA Update, one virtual and one in-person. The in-person meeting took place in snowy Chicago at ALA Midwinter. Among other topics discussed at each was the request by the RUSA President to work on a database (in collaboration with other RUSA committees and members) of professional development offerings presented by RUSA. The results of this discussion were presented at RUSA Board II and resulted in the formation of a “task force” to investigate and implement this project. The CPCC chair also presented information to RUSA membership on the process of submitting programs and pre-conferences at the inaugural RUSA 201 webinar in January 2015. RUSA will be posting the submission form for 2016’s Midwinter pre-conferences and Annual programs in early March. CPCC is looking forward to receiving proposals in early May. The RUSA Membership Social at ALA Midwinter Chicago was a resounding success with more than 100 attendees! RUSA 101 and 201 are doing very well, averaging 14 people per session. If you or your group would like to participate in either RUSA 101 or 201, please let Ann Brown (agbrown@gwu.edu) know. We’re always looking for special guests! Calling all BRASS volunteers. Please considering serving our wonderful BRASS section. Committee positions will start after ALA Annual 2015 (San Francisco) and are generally for a two-year term. I hope you all will begin considering to serve on a committee again, or perhaps for the first time. Indicate which committees you would like to help with. You do not have to commit to traveling to conferences in order to volunteer. While some committees must meet in-person, many have virtual assignments, and some do all their work online. Most committee assignments last two years (there are exceptions) and begin and end after ALA Annual conference. I’m looking forward to working with all of you in BRASS. The BRASS Business Reference in Academic Libraries Committee recently conducted a virtual Midwinter conference meeting. The committee discussed the upcoming program at ALA annual. Charles Allan, the committee chair and editor of the BRASS newsletter, solicited submissions for the newsletter from those present. We also discussed program ideas for the 2016 conference. New Additions to the Public Librarians Briefcase. Details on this summers’ Forum, about new revenue streams for libraries, to be held Saturday, June 27, 1 – 230pm. The panel includes Deborah Doyle, current Development Director of the Friends of San Francisco Public Library, John Trischitti III, Director, Midland County Public Libraries and the Texas Library Association 2014 Librarian of the Year, and Jan Busa, Jan Busa, Management Analyst II, who set up the San Mateo Public Library passport Assistance Center. Ed Rossman, chair of the committee, will moderate. One more panelist is expected to speak on crowdfunding. Solutions to the problems faced by the IRS not issuing the quantities of paper tax forms they’ve done in the past. The BRASS Discussion Group hosted a virtual discussion on November 21, 2014. Topics focused on providing support for entrepreneurs and small business development. Makerspaces were also discussed. The recording is available on ALA Connect. The BRASS Midwinter All Member Committee Meeting and Discussion Group took place on February 1, 2015. There were about 20 people present, and we had a lively discussion about vendor and resource updates. Thank you to the committee members who have helped coordinate these discussions. The next virtual discussion of the BRASS Discussion Group will take place on February 20, 2015. We will be discussing faculty liaison work and e-book strategies. Editorial review of the new BRASS Business Guides is on the way. The estimated completion time is April 15th. The goal is to have an editorial team of at least two editors to work with a guide’s author to ensure currency and quality of the BRASS content. A continental breakfast will be sponsored by S&P Capital IQ from 8 to 8:30 am. Laura Young is a seasoned expert in business research and competitive intelligence. Combining seven years leading the research department at Austin Ventures, four years coordinating the Reference and Information desk at the University of Texas Perry Casteneda Library and seven years honing her customer service expertise as a Walt Disney World Guest Services Supervisor, Laura can tackle any research project, in any industry, with grace and speed. She has performed Due Diligence analysis for HomeAway, RetailMeNot, MapMyFitness, Magnablend, Bazaarvoice, Silvercar, Spredfast, Food on the Table, Delta Rigging & Tools, among many others. She is a highly sought after speaker on emerging research trends and regularly presents for Texas Library Association, Special Libraries Association, and American Library Association. When she’s not digging for the next important piece of data, Laura can be found relaxing with her Basset Hound and PBGV rescues, catching up on the latest episodes of Mad Men, or culling design ideas from local architectural tours. Amelia Kassel is president and owner of MarketingBase, a global business research firm since 1982, specializing in industry, company and competitive and market intelligence research. Amelia holds a master’s degree in library science (UCLA) and combines expertise about the Internet and electronic databases with knowledge of business and marketing strategies. A recognized author and international speaker, Amelia conducts seminars for associations and conferences and gives workshops onsite for companies and organizations. She is also known for her successful one-on-one email-based Mentor Program in which she trains business searchers how to conduct research and aspiring independent information professionals how to develop to successfully develop and grow their businesses. The Publications and Communications committee will be meeting shortly after the BRASS Chairs meeting. The Publications and Communications Committee will be putting together a preliminary draft of the BRASS ALA Annual 2015 Schedule of Events in March. The P&C Committee will be soliciting committee chairs for their program and meeting information via a Google web form, as we did last year. This draft version will not have as much information as the final version, but will be a means to notify BRASS members well in advance of ALA Annual about the types of programming available. The preliminary draft schedule should make it easier in piecing together the final schedule in May/early June. The Committee worked with Todd Hines to arrange for the annual breakfast sponsorship with S&P Capital IQ at the 2015 ALA Annual. Sponsored by Gale Cengage Learning, this $1,250 monetary prize is given to a student enrolled in an ALA accredited master’s degree program to fund travel to and attendance at the ALA Annual Conference and a one-year membership in the Business Reference and Services Section (BRASS) of RUSA. At this writing, the committee is still accepting applications through Sunday, February 8, 2015. Watch for RUSA to announce the 2015 award recipient in March! The award committee was pleased to receive several nominations of public librarians providing excellent business reference support for their communities. The committee selected Barbara Alvarez, Business Liaison Librarian at the Barrington Area Library in Barrington, Illinois, as this year’s recipient of the BRASS Morningstar Public Librarian Support Award. Ms. Alvarez works with business persons in her area both individually and in partnership with a number of local organizations, offering training in business research, job seeking, and creating podcasts and websites. We are delighted that she will be present to participate in BRASS activities at the ALA Annual Conference in Las Vegas. Grace Liu, Business Reference Librarian at University of Maine, is the recipient of the RUSA BRASS Academic Business Librarianship Travel Award. Ms. Liu’s background in industry has allowed her to leverage a recent education in librarianship to help her constituents. Projects in her first year as a business librarian include library instruction to classes and local small business, design of a library 101 class for first year business students, development of an embedded library service model, and creation of a student advisory committee. We wish Ms. Liu all the best in her new career and hope that this travel grant for the ALA annual meeting will help her to enhance the development of her career and to further contribute to the profession of business librarianship. The Genealogy Preconference at ALA Midwinter had something for everyone, from the librarian who specializes in genealogy reference to those who find themselves answering family history questions in a general reference setting. Attendees learned about free resources for learning more about family history so they can better understand their patrons’ questions. They also discovered online resources for genealogical and local history materials, including those for ethnic populations. Those with collections that they would like to see online were particularly interested in the session on partnerships with commercial and non-profit organizations. Genealogy and Local History Discussion Session had a lively discussion about building relationships between different types of libraries engaged in Genealogy reference service. University of Iowa Libraries (Tom Keegan) began the DIY History Project, transcribing civil war letters and diaries with the help of volunteers. Presenters’ slides are now available on the History Section website: http://www.ala.org/rusa/sections/history/presentations. The Best Historical materials list was announced at the RUSA Book and Media Awards Ceremony at ALA Midwinter. Annually, this committee selects the best historical bibliographies and resources. For a complete list of the winners with descriptions see: http://www.ala.org/news/press-releases/2015/02/annual-list-best-historical-materials-selected-rusa-s-history-section. Winners are: Europeana 1914-1918; Mapping Gothic France; 1914-1918 Online: International Encyclopedia of the First World War; Lowcountry Digital History Initiative; Darwin Online; Freedom Summer Digital Collection; Densho Digital Repository; Roaring Twenties. We are working on a webinar that highlights three programs developed to support individuals’ efforts to archive their personal and family histories. In the fall of 2013, Jordan Welborn, a librarian at Campbell County (VA) Public Library got a six-week pilot program on personal digital archiving set up for less than $300. At the University of Central Florida, graduate student Ashley Vance conducted a History Harvest, a community-based digitizing event of personal artifacts to be placed onto the UCF digital archive. And Noah Lenstra, a PhD candidate at UIUC’s Graduate School of Library & Information Science, has given a series of public workshops on “Digital Local & Family history” across Illinois. We have an upcoming webinar on Tuesday, May 12, 2015: 2-3:30pm: Exploring Partnerships with Faculty and Other User Groups for Digital Humanities Projects. (see http://www.ala.org/rusa/exploring-partnerships) which will provide specific examples of the ways in which librarians from two academic libraries actively participated in digital humanities projects with different user groups. Hear Chella Vaidyanathan from Johns Hopkins, Caitlin Christian-Lamb from Davidson College, and Mary Elings from The Bancroft library on the UC Berkeley campus talk about specific collaborative projects. The History Section Instruction & Research Services Committee (IRS) is revising the RUSA page “Using Primary Sources on the Web” (http://www.ala.org/rusa/sections/history/resources/pubs/usingprimarysources) Originally written in 2003 and last revised in 2008, the Committee’s work will include updated content, a more contemporary look to the page and include new content for students and the public on ethical uses of internet sources. More to come later this spring. The Committee is also beginning to look at ways of improving communication among history librarians beyond the ALA Annual and Midwinter conference experiences. The Committee would like to keep the conversation about ideas, best practices, and clever solutions to promoting and supporting history librarians going; the Committee wants to reach out across the spectrum of libraries and cultural institutions, so watch for news on this communications front as well. The Genealogy Committee is working on revising two sets of guidelines: Guidelines for a Unit or Course of Instruction in Genealogical Research at Schools of Library and Information Science and Guidelines for Developing a Core Genealogy Collection. Established in 1992 and sponsored by Genealogical Publishing Company, this award may be presented to an individual, group, publisher, or institution in recognition of achievements and activities in historical or genealogical reference, service or research. Sponsored by Genealogical Publishing Company; the 2015 award is $1,500 and a citation. The recipient shall be selected for exceptional accomplishment in one or more of the following areas: leadership; service; training; reference; or publication of recent, significant print or digital reference works/projects that offer access to genealogical or historical sources. Preference shall be given to members of RUSA. Between now and annual the Genealogical Publishing Company Award Committee will be working an Award manual following the style suggested by the RUSA awards coordinating committee. MARS: Emerging Technologies in Reference Section is a busy group of folks dedicated to the intersection of technology and library services. There is a place for everyone in MARS and we hope that you will join us at conferences or engage in our online offerings. Below are some highlights from this past year of MARS happenings, as well as some announcements on things to come! This year’s ballot will bring you not only a slate of well qualified candidates for the Vice Chair/Chair Elect position and a Member at Large position, but also, for the first time in a number of years, a number of bylaws changes on which to vote. First, we’re voting to change the acronym from MARS, which we have known and loved for 37 years, to ETS, for Emerging Technologies Section. Although the MARS acronym has a good history and holds significance for many of us who have been in the profession a while, we’re finding our newer colleagues are confused by the lack of alignment between the MARS acronym and the name we choose in 2010: Emerging Technologies in Reference Section. By aligning our acronym with our name, we hope to eliminate a lot of the confusion. Additional bylaws changes are being made primarily to clean up language and bring the handbook up to date with current practices. Please take a look and remember to vote this Spring. The Planning Committee and the Executive Committee recommend you vote YES on all six (6) items. To amend Bylaws Article I, Name, Section 1 by changing the acronym from MARS to ETS. To amend Article V. Nominations and Elections to add the procedure of online balloting for elections in accordance with current ALA practice. To amend Article VII. Executive Committee to delete references to positions which no longer exist. To amend Article IX. Discussion Groups to remove the acronym and to clarify roles. To amend Article XII. Adoption and Review by adding language to include the ALA balloting process. For the 2015 Spring ballot, the Nominating Committee has identified four well qualified candidates for the positions of Vice-Chair/Chair-Elect and Member at Large. For Vice-Chair/Chair-Elect: Shannon D. Jones, and Courtney Greene McDonald. For Member at Large: Jason Coleman, and Beth Boatright. Be sure to check out their biographies when you receive your ballot. Eligible members will be sent their voting credentials between March 24-27, 2015. Votes must be received by May 1, 2015. For more on the ALA 2015 election cycle, including a link to the video of the ALA presidential candidates forum, please see: http://www.ala.org/aboutala/governance/alaelection. Are you interested in the great work that MARS is doing? Interested in participating in committee work? Take a look at the variety of committees available as part of the MARS: Emerging Technologies Section: http://www.ala.org/rusa/sections/mars/marssection/marscomm/committees. If you see one that interests you or you have questions about a particular committee, please contact me, Donna Scanlon (dscanlon@loc.gov), MARS Vice Chair, for additional information or to volunteer for a MARS committee. MARS hosted some great discussion groups at ALA MidWinter 2015 in Chicago. Despite the blizzard, lots of folks came out to discuss how they are using technology to help their library users. Our Virtual Reference Discussion Group met on Saturday, January 31st for an opportunity to share ideas about front-line virtual reference services and best practices. On Sunday, February 1, 2015, the Management of Electronic Resources and Services (MERS) Discussion Group held a well-attended discussion group. They focused on assessment of library resources embedded in course management systems. Participants heard from several panelists, as well as sharing experiences from their libraries. Also on Sunday, February 1st, the Hot Topics group hosted a discussion forum on Augmented Reality. Participants explored how augmented reality was being applied in libraries. Check out the great MARS programming that is coming your way during the Annual Conference 2015 in sunny San Francisco. Despite the variation among our institutions, efforts to integrate library services into Course Management Systems involve negotiating a combination of technical and political challenges. Relationship-building, leveraging existing relationships, and acting as liaison between different campus partners must be combined with learning the technical possibilities and constraints of CMS architecture. Analytics are extremely important for the placement of links to library resources and services anywhere in the institutional online presence, including within the CMS. We need to work together to explore ways to demonstrate the impact of library resources and services on student success. The ACRL Assessment in Action Program was cited as an avenue that could provide support in proposing this type of research to campus partners and overcoming privacy issues. Opportunities: services that we already provide, such as Reserves and Reading List Services (which we should start rebranding as Resource List Services to indicate that we are not limited to the printed word) are examples of services that translate naturally into the CMS environment. Once this type of service is established within the CMS, relationships with campus IT and Learning colleagues are established, and the library presence within the CMS can be expanded. Course Management Systems provide us with the opportunity of pushing relevant library content within the appropriate context and at point of need for students. Quality & Sustainability: what library staff resources does it take to successfully integrate library services into the CMS? With CMSs such as Canvas, the architecture is available to automatically embed relevant library guides into individual courses by subject, course code, etc. When we push our content, it must be of excellent quality and continually maintained. Common issues such as libguide tab-mania and out of date guides must be managed and avoided. There pushed content, such as library guides. These guides are learning objects, which should adhere was general consensus on the importance taking a minimalist approach in the creation of to information literacy principles. Thanks to everyone who attended and participated. Look for our final Forum on CMS Integration at Annual 2015 in San Francisco! Chicago rolled out the snowy carpet for Midwinter! And while the weather was not always agreeable, RSS was active with discussion forums, committee meetings, and the annual Pancake Breakfast. I’m sure the weather in San Francisco will be slightly warmer. Are you interested in becoming involved in an RSS committee or representing RSS on a RUSA-level committee? Now is the time to volunteer. Crystal Lentz, RSS Vice Chair, will be starting the appointment process shortly. Here is the form to note your interest in volunteering: http://www.ala.org/cfapps/committee/volunteerform . If you have questions or would like to learn more about RSS and its committees, please feel free to contact me at q-johnson[at]northwestern[dot]edu or Crystal Lentz at crystal[dot]lentz[at]sos[dot]wa[dot]gov . Want to learn what committee might be the best fit for you? Check out the RSS committees through ALA Connect to learn about ongoing work and future projects. Keep an eye out for information about the RSS and RUSA sponsored programs and discussion forums at Annual! Regardless of your experience in high school, you may be eligible for the RSS Honor Roll. The RSS has an Honor Roll that gives recognition to active RSS members who have served the section in three different capacities since its inception. Not only will you become a member of this esteemed group, you will also be recognized at ALA Annual in San Francisco!